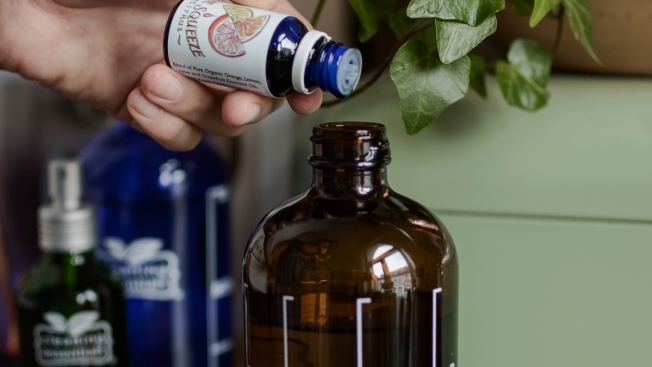 This photo provided by Cleaning Essentials shows the company's reusable cleaning bottle and recipes for nontoxic cleaners. And list all ingredients clearly on the jar or spray bottle. Don't use lemon on wood, since it can destroy protective finishes, says Sisco. Don't overdo it with vinegar, which can dull surfaces, she says. There's a reason that cleaning-product recipes call for adding water. Window cleaner: For clean, streak-free windows, Condon, at Better Homes & Gardens, swears by the combination of 2 cups hot water, 1 tablespoon corn starch, 1/4 cup white vinegar and 1/4 cup rubbing alcohol. "I tested a bunch of recipes, and this one is hands-down the best for mirrors and windows," she says. All-purpose cleaner: Sisco, at Real Simple, recommends combining 2 tablespoons lemon juice, 2 cups of water and 1/2 teaspoon of castille soap, such as Dr. Bonner's. For a stronger cleaner, she recommends mixing 1/2 cup vinegar, 1/2 cup vodka, 10 to 20 drops of essential oil and 1 1/2 cups water.